NEW YORK (AP) — It's all about the tutu for Serena Williams at the U.S. Open. NEW YORK (AP) — Andrew Balducci, the New Yorker whose famed Greenwich Village gourmet food mecca attracted fans including Anna Wintour, Lou Reed and Lena Horne, has died. He was 92. He and his wife, Nina Balducci, "really taught New York how to eat and cook genuine Italian food at a time when it was perceived as little more than pizza and pasta covered with red sauce and gooey cheese," wrote food critic Julia della Croce. Emily Blunt would be "down" for a 'The Devil Wears Prada' sequel. The 35-year-old actress plays Emily Charlton in the 2006 movie, alongside Anne Hathaway, Meryl Streep and Stanley Tucci and has said that she would be up for returning to the character if everyone else wanted to too. Speaking about the possibility of another movie, she told Entertainment Tonight: "I mean, if everyone wanted to do it, it would be cool ... I'd be down." ROME (AP) — The Vatican, Versace and Vogue are joining forces to show off the Catholic influences in fashion. 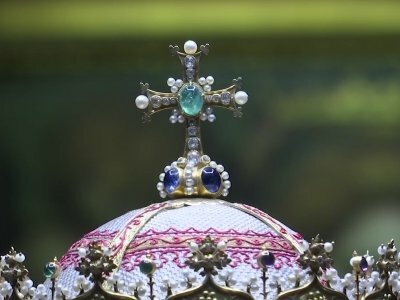 The Vatican's culture minister joined Donatella Versace and Vogue's Anna Wintour on Monday to offer sneak peek of gorgeous Vatican liturgical vestments, jeweled miters and historic papal tiaras that will star in a spring exhibit at the Metropolitan Museum of Art in New York. ROME (AP) — She has sat next to royalty both Hollywood and real, often donning her trademark dark sunglasses to block the glare from the catwalks of the world's fashion capitals. Vogue editor-in-chief Anna Wintour had a front-row seat of a different sort Monday, on hand for a sneak preview of the Metropolitan Museum of Art's spring exhibit of the Costume Institute, which will feature 40 vestments and liturgical accessories from the Vatican. Hollywood icon Meryl Streep has told Vogue Editor Anna Wintour that playing her in 'The Devil Wears Prada' was her toughest on-screen task. Rihanna, Amal Clooney and Donatella Versace will host the 2018 Met Gala. The trio will join forces with editor Anna Wintour to stage what is regarded as one of the biggest nights in fashion in New York on 7 May, 2018, and this year's event will be called 'Heavenly Bodies: Fashion and the Catholic Imagination', Vogue has revealed. Guests attending Burberry's catwalk show at London Fashion Week have found their usual red carpet welcome replaced by heckling protesters. Dozens of animal rights activists made a loud racket Saturday outside the luxury brand's show venue in London's Clerkenwell area, crowding around the entrance and shouting "Shame on London Fashion Week!" Wintour was made a dame — female equivalent of a knight — for services to fashion and journalism in a Buckingham Palace ceremony on Friday. The U.K.-born editor arrived wearing her ever-present sunglasses, but removed them before entering the palace ballroom. Lena Dunham was rushed to hospital from the Met Gala. The 'Girls' creator had posed on the red carpet in her custom Elizabeth Kennedy dress at the annual event at the Metropolitan Museum of Art on Monday (05.01.17) but reportedly had to make a quick exit due to an unspecified "medical issue". According to the New York Post newspaper's Page Six column, the 30-year-old actress - who has openly spoken about her battle with endometriosis - was released shortly afterwards following a "series of tests". Gwyneth Paltrow backtracked on an earlier promise by attending the Met Gala in New York City on Monday (05.01.17). The award-winning actress had previously pledged never to return for the annual fundraising event at the Metropolitan Museum of Art, saying it was "so un-fun" - but Gwyneth returned to the red carpet for the bash last night, wearing a one-shoulder Calvin Klein dress for the occasion. NEW YORK (AP) — Gwyneth Paltrow and Vogue editor Anna Wintour are teaming up to take the actress' Goop website to print through a partnership with magazine publisher Conde Nast. Wintour, who is also the artistic director at Conde Nast, says that through the Goop brand, Paltrow has built a "thoroughly modern take on how we live today." PARIS (AP) — The Metropolitan Museum's Costume Institute previewed parts of its highly-anticipated exhibit Monday honoring Comme des Garcons designer Rei Kawakubo during Paris Fashion Week. Kawakubo, 74, attended the sneak-peak session alongside Vogue editor Anna Wintour. Wintour will co-chair the May 1 Met Gala that inaugurates the exhibit with Katy Perry, Tom Brady, Gisele Bundchen and Pharrell Williams. LONDON (AP) — All eyes were on Burberry and creative director Christopher Bailey Monday night as London Fashion Week reached its starry climax. Bailey didn't disappoint, drawing on the sculptor Henry Moore for inspiration in a startling new collection that built on the English heritage brand's traditional appeal. The Burberry spectacle capped four days of shows that highlighted London's claim to be an international fashion hub that rivals Paris, Milan and New York. NEW YORK (AP) — President-elect Donald Trump sat down Friday with executives at Conde Nast, a magazine chain whose editors have frequently been his foes. NEW YORK (AP) — The annual Met Gala, one of the most anticipated events in the fashion world, will honor designer Rei Kawakubo of Comme des Garcons. HOUSTON (AP) — When you're Russell Westbrook, the undisputed king of NBA fashion, you don't spend the offseason like a typical player. The five-time All-Star passes his time designing clothes, perched on the front row for shows during New York Fashion Week or talking style and tennis with Vogue magazine editor-in-chief Anna Wintour. 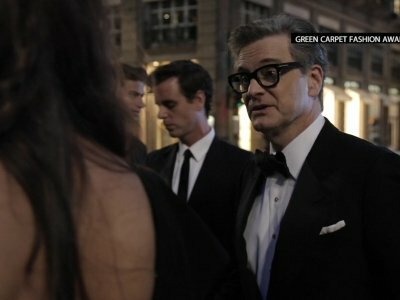 NEW YORK (AP) — The one sound you usually never hear at a fashion show, with its pounding music and high-decibel chatter, is silence. But just before the Victoria Beckham show on Sunday — at 10:28 a.m. — the room fell silent in observance of the 15th anniversary of 9/11. The only sound was the clicking of cameras, as the designer's husband and oldest son — soccer great David Beckham, and Brooklyn Beckham — stood in remembrance, along with Vogue editor Anna Wintour. West described himself as a "thought leader" in a rambling speech that included a defense of his "Famous" video and shout-out to former flame Amber Rose.